In the heart of Antwerp, metropolis and world harbour, with a choice between cosy and quietness, and modern comfort. 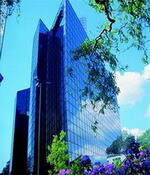 Luxurious hotel in the city centre close to the Central Station. 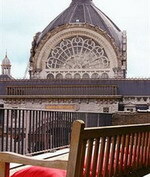 With its central location in the historic centre of Antwerp, the Theatre Hotel is situated in a quiet environment in the immediate vicinity of the beautiful Bourla-theatre and the greatest attraction being the world-famous Rubens house, in between a variety of designer shops, cafes and bistros. Own Health & Relaxation centre (fitness room, swimming pool, whirlpool, sauna, solarium, Hamam). Free of charge for hotel guests (except solarium). The restaurant's menu offers something for every guest - from traditional Belgium dishes to delicious Italian taste sensations. With a mirrored glass façade overlooking the De Hoertoghe Park, this modern hotel is 3 kilometres from the city centre. Guests can workout in the fully-equipped fitness room and relax in the sauna. Staff at the 24-hour front desk can arrange babysitting, currency exchange and a laundry and dry cleaning service. Motorists will find onsite parking facilities or the hotel can organise sirport transfers. There is a gift shop and wireless internet is available in the hotel's air-conditioned public areas. Coffee and complimentary newspapers are on hand in the lobby. Large windows afford plenty of natural light in the contemporary restaurant, which opens onto a terrace for outdoor dining in fine weather and aperitifs and light snacks are on offer at the Bar. Charleroi is the first city and municipality of Wallonia in population. It is located in the Belgian province of Hainaut. The inhabitants are called Carolorégiens or simply Carolos. The municipality features an industrial area, iron and steel industry, glassworks, chemicals, and electrical engineering. Charleroi is in the center of a vast coal basin, called Pays noir. Many slag heaps still surround the city. Housed in a former monastery Charleroi's Photography Museum has recently become the largest of its kind in Europe, thanks to a new wing opened in 2008. The Leonardo Hotel Charleroi City is located in Charleroi, Belgium, 300 metres from Charleroi Sud Train Station, and 500 metres from the Museum Of Fine Arts and the city centre shops. Brussels South Charleroi Airport Is Nine Kilometres From The Hotel. Situated in a modern glass- fronted building, the hotel has a cream-toned lobby with patterned rugs and a 24-hour front desk. Complimentary newspapers are provided in the lobby and wireless internet is available in all areas (fees apply). Staff at the concierge desk can assist with tours and transport. Belgian and European specialities are served in the Leonardo Hotel's Restaurant Le Bruxelles, which is decorated in cream with light wood furniture. A buffet breakfast is available daily for a surcharge. The adjoining Manneken Pis bar offers a range of Belgian beers. Ostend (or Ostende) is a Belgian city of about 70.000 people, the largest on the Belgian coast. In earlier times, it was nothing more than a small village built on the east-end (Dutch: oost-einde) of an island (called Testerep) between the North Sea and a beach lake. Although small, the village rose to the status of "city" around 1265 when the inhabitants were allowed to hold a market and to build a market hall. This hotel is only 150 metres from the beach in the centre of Oostende and features an indoor swimming pool and fitness centre. Oostende Railway Station is a 10-minute walk away. De Haan and Brugge are both less than 30 minutes away by car. The Sea Life Centre in Blankenberge is just over 30 minutes’ drive from Golden Tulip Oostende. Bero features the On The Rock’s Bar which serves beers and cocktails in a casual setting. It also offers over 70 different whisky including cask-strength whiskies from the Scotch Malt Whisky Society. 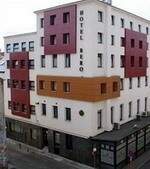 Each room at Golden Tulip Bero Oostende includes 32 inch flat-screen TV and an en suite bathroom. Guests can use the solarium, sauna and a steam bath at Golden Tulip Bero for a supplement. Thermae Palace has developed into an excellently equipped hotel with 159 rooms, a bistro, a restaurant and an international conference and seminar centre with beautiful multifunctional halls. The hotel is impressively located, directly by the beautiful beach of Ostend, within walking distance of the exciting city centre. The varied surroundings offer something for everyone, in the field of sports as well as culture. 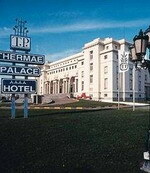 Everything you dream of in the culinary field, you will find at Thermae Palace. You will experience our 4-star service personally in our gastronomic restaurant Périgord. You can dine here à la carte or you can enjoy one of our refined menus and, of course, the always magnificent view of the sea. In the attractive bistro Paddock you are always welcome to enjoy a drink or a cup of coffee, for example after a long walk on the beach, but also for a tasty and well-catered meal.